First airing on FOX Friday, October 19, 2007, episode 21 of the myrtle beach TV series entitled, "Chili Pizano" opens at Liberty Taproom in Myrtle Beach where Grand Strand area bloggers, podcasters, and new media makers gathered to have a few cold ones and get to know each other a little better. We then take viewers down to Spud's Waterfront Dining in Murrells Inlet for the first of two Strand's Grand Leadership segments, this with Senator Ray Cleary. Senator Cleary gives Scott Perez his definition of leadership, and how he applies that definition in his role of serving his constituents. Next its over to Broadway at the Beach for the 2007 Start! Waccamaw Area Heart Walk, where Scott Perez talks with several walkers, including Bill McKown, co-chair of the walk, Crystal Garrett, Miss South Carolina 2007, and Deane Vinson, logistics chair of this year's fundraiser. We then head back down to the Hot Fish Club in Murrells Inlet for the 8th Annual Lip Rippin Chilypmics fundraiser for the local chapter of the Surfrider Foundation, where we meet up with lots of locals, including chilypmics judge Cecil Chandler, who shows viewers just how hot the chili really is! We also talk with Bruxanne Hein, organizer of this highly attended fundraiser, about the Surfrider Foundation's functions within the communities of the Grand Strand. Back up in Myrtle Beach, we previewed the upcoming Myrtle Beach Haunted House and Tour, benefitting the Make-A-Wish Foundation, where Jerry Pinkas gave us a little background about why he started it, and what goes on during two gruesome evenings here on the Grand Strand. After last week's glimpse at the Sunday brunch at 3500 Ocean Grill at the Prince Resort, we returned there this week for a more ample showing, and some delectable samples. Also: Gogglez Pizano, with Bob Bradley, at Dagwood's Deli and Sports Bar in Surfside during their Oktoberfest celebration; an update and tour of The Market Common on the old Airforce Base in Myrtle Beach; a return to Spud's in Murrells Inlet to talk with political consultant Tom Herron about leadership; a people's choice chili cookoff at Broadway at the Beach; and a thoroughly entertaining Sunday evening of Dixieland music at Flo's Place in Murrells Inlet. 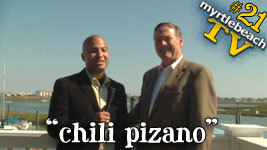 Watch episode 21, "Chili Pizano", in its original HD format, by clicking here, or by clicking on the photo above.